We are married couple Martina and Sebastian . We have two children, the older daughter Sabina and the younger son Lukas. In the house lives with us four Pinschers, Sabina´s cat - Bara and guinea pigs. 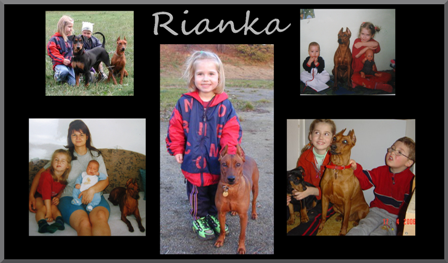 Our first Pinscher, red female Riana Rhapsody Rozárka, born 6.8.1999 came to our house on 13.1.2000. Imported male Gronn Harmony is only one black and tan pinscher in our house. He was born on 3/2/2006. He arrived on 28.3.2006 from known Finnish kennel Dogiwogin. We love pinschers for their lovely,very sweet and loving nature and for good health. Therefore, we have kept at home from the last litter, Riana´s and the first mating of Gronn, two red puppies. Female Dorra Doriana Harmony Star and male Don Cherry Harmony Star. We practise with dogs different light elements of dance with a dog, job training and agility hurdles. Our dogs loves to run next to bike. Our dogs love children and other people. Our dogs have all health tests. At the show they have also very nice results and criticism. We love their good mood, which is typical for the pinschers. A dog of superior intelligence. The German Pinscher originated in Germany and is included in the origins of the Doberman, Miniature Pinscher and other Pinscher types. They are closely related to the Standard Schnauzer. They are a handsome, robust, squarely built, medium size dog with aristocratic bearing. Black and tan, various shades of red, fawn, and blue and tan, with a short, flat coat. They are not excessive barkers. Noted for guarding the home and family. They are a high commitment dog: very intelligent, determined, manipulative and assertive. The German Pinschers make a wonderful companion with firm yet gentle and consistent discipline. They keep their playfulness well into adulthood. The German Pinscher is a medium sized dog. Knee high, they are between 45-50 cm high at the shoulders and generally weigh about 12-18 kg. but warns away strangers with a strong voice which it saves for such occasions. And woe unto the attacker or intruder! for they insist on being a part of the family activities and develop best when treated in this manner. For this reason, most German Pinschers are house pets. They are outstanding companions, known for their devotion and love of the family. Because of their strong will, intelligence and independent nature, early socialization and obedience training is a must. spirited German Pinscher will not be a good choice as a family dog. Due to their intelligence, they learn quickly; but like a mischievous child, they need a firm, but not rough, hand. They quickly housebreak and learn the house rules. But, they will get away with whatever they can and soon "rule the house" if allowed. They excel in obedience and agility, with enthusiasm and intelligence. The happy German Pinscher is a dog with a job to do. They love to work. They are not excessive barkers, as noted above. They love to jump when greeting family and friends and should be trained to resist this temptation. German Pinschers love toys and puppies will de-squeak and de-stuff as many toys as you will give them. Also, German Pinschers will look you right in the eye and some will smile, showing their teeth in a big grin, usually when they are in trouble. The German Pinscher needs daily exercise. They are happiest when they can run free in a supervised fenced yard. However, they can do just as well in an apartment setting if given a minimum of two long walks per day. The German Pinscher is a healthy breed and none of the health problems that may occur are unique to German Pinschers. The German Pinscher is not for everyone. the German Pinscher will not tolerate much physical or mental abuse from the family children. caution and supervision is important around young children.